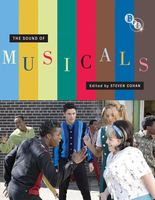 “The Sound of Musicals” (Palgrave Macmillan for the British Film Institute 2011), a new book edited by Steven Cohan, professor of English in The College of Arts and Sciences at Syracuse University, was released in February in the United States. The book was previously released in the United Kingdom in December 2010. Movie musicals remain a flourishing 21st-century form. “The Sound of Musicals” examines the films, stars, issues and traditions of the genre from the 1930s to the present day. Featuring 16 original essays by leading international scholars, this illuminating collection addresses the complex history and global variety of the movie musical, and considers the delight and passionate engagement that musicals continue to inspire in audiences around the world. Cohan’s books include “Telling Stories: A Theoretical Analysis of Narrative” (co-authored with Linda M. Shires, Routledge, 1988, ), “Masked Men: Masculinity and the Movies in the Fifties” (Indiana University Press, 1997), “Incongruous Entertainment: Camp, Cultural Value, and the MGM Musical” (Duke University Press Books, 2005) and “CSI: Crime Scene Investigation” (British Film Institute, 2008).